This was a great idea, a little bit like Battleship games we use to play as a kid, but made to look much more professional in this format. 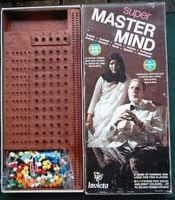 The game was invented in 1970 and is played like a code breaker game. The idea is for one person to set up in secret a number of coloured balls in a line, then have that covered by a plastic sheath, Then the player has to guess the colours and the order of the colours in a number of moves. He does this by placing coloured balls on the game, and if he has correct colours and correct colours in his list he will receive coloured pegs telling him so. By doing this it will be possible to break the code in about 12 moves, if not you LOSE. Now I use to play this, and I probably won it 50 percent of the time, but by half way through my thought processes were all over the place, and I honestly think it was pure luck. About 55 million sets have been sold, and the cover had a distinguished older white man with a beautiful Asian lady on it. It looked like it should have been a spy game, but I suppose code breaking makes it have that feel.